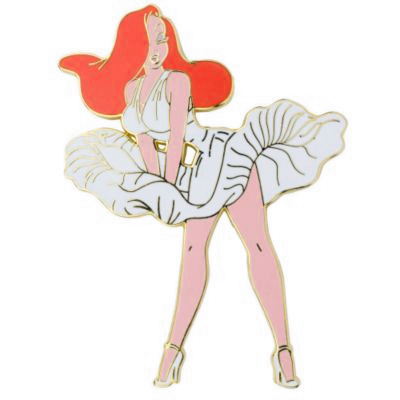 When it comes to the Holy Grail of Jessica Rabbit pins, the Movie Star Jumbo is definitely the one that stands out as the most desired, and most notorious, of all pins. What really did happen, and why is it so important? Read on to find out more! Back in the summer of 2006, the Jessica Rabbit pin craze was in full swing. 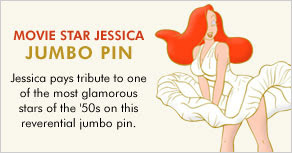 There had been around 50 Jessica pins released during the first half of 2006 alone, and so much more on the way. Many of the pins from that time frame had been the coveted Disney Auctions LE 100 pins that fetch a hefty price now. What set the Disney Auctions pins apart from other pins was the quality, low edition size, and the artwork. So when the art you see to the left appeared on Disney Auctions - pin collectors and Jessica fans drooled uncontrollably. 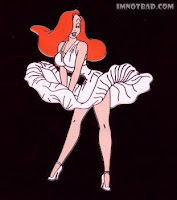 The pose is of course borrowed from screen legend Marilyn Monroe during her infamous scene from The Seven Year Itch. 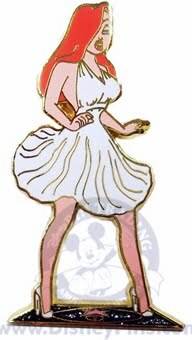 While it was not officially called Jessica as Marilyn Monroe, the Disney Auctions description read: Jessica Rabbit gets a case of the seven-year itch, imitating a famous movie star of the past on this gorgeous gold-finished character pin, a Disney Auctions exclusive in a limited edition of 100 jumbo pins. Before bidding had even ended, Disney pin websites and newsboards had already started calling it the Holy Grail of Jessica Rabbit pins. Clearly this was the pin to have! However, a big problem arose with this pin. While I cannot remember what the starting bid was for the pin, the ending bid for all 100 pins finalized at $105 each. That's quite a lot to spend on one pin. I was one of the lucky high bidders and couldn't wait to get it. Then - Disney started to send out emails (which I never did get) claiming that these pins were not available at the time of the auction. Collectors were frantic and started to call and email Disney Auctions to find out what happened. Unfortunately, no one got a straight answer and all we were left with was that the pins were "lost" and that we would not be billed. I don't recall if people were told that they would be notified if the pins were found, but I'm pretty sure that would have been a standard answer from any company claiming to have lost their merchandise. Disney lost a few other LE 100 Auctions Pins as well. This angered many people. Disney had already amassed many complaints from unhappy customers over a short time with claims of damaged merchandise and unfair return policies on limited merchandise. Run in part by eBay, they had an extremely high negative feedback count, and eventually the Disney Auctions website closed not too long after this whole incident. Naturally, this left people assuming the missing pins would never turn up. Two years passed, low and behold, the missing pins started to show up on DisneyShopping.com (including the Jessica Movie Star Jumbo.) None of the original bidders had been notified about this, and that particular Jessica pin was listed for sale on the website on a Friday. Many people know that it was common practice for Disney to only list pins on Monday mornings. I don't know of anyone who was actually able to buy the pin from the site that day, but the pins were sold out in record time - and sold for $20 each !!! That is a huge difference from the $105 bidding war which took place two years prior. To this day that was the only time pins had ever been listed for sale on a Friday. I did eventually get this pin and I have to say it IS the best Jessica Rabbit pin out there. The pose is great. The work on it is fantastic - and being a jumbo pin it stands at almost 3 inches tall. 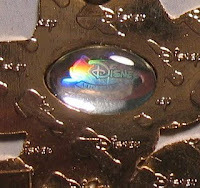 There is even a hologram logo on the back which Disney created in order to stop the sale of unauthorized counterfeit pins which had started to become a big problem. The back of the pin is also embossed with the Disney Auctions logo. However, all this didn't stop people from trying to recreate this pin. Above you will see a fake - and horribly create, Jessica pin. There is no mistaking this for the real thing. The work on it is terrible. There is no way anyone could mistake this for the real thing. Jessica had a lot of luck dressing like film legend Marilyn Monroe. There have been two other pins released which have also become popular. One of them is the Jessica in Hollywood Cast Member Create-A-Pin from 2009. Jessica takes a stroll on the Hollywood Walk of Fame in the classic white dress. 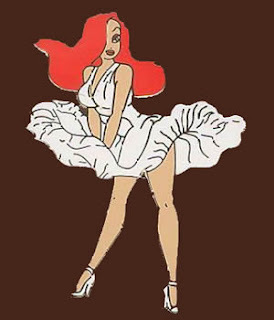 The other is from the Jessica Rabbit in Hollywood set from 2006. Jessica's look is more accurate to the film and this time her hair matches that on Miss Monroe. The set was a LE 100 and are going up in price very quickly in the last year. This was another of those Jessica sets that sold out within minutes of release. There are three other rare pins to add to this debacle. 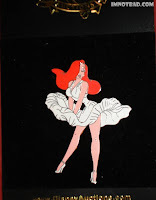 At the 2006 It All Started With Walt Pin Event, artist proofs of the Jessica Rabbit Movie Star Jumbo were part of a prize pin lot given out. There were the usual black, silver and gold metal proofs - only one of each. The one pictured left is the silver, and sold on eBay some years ago for over $500. I know the person who has this pin but I don't know about the other two. If anyone has them please send an email so I can put up photos - they are going to be quite the expensive collectors item some day. 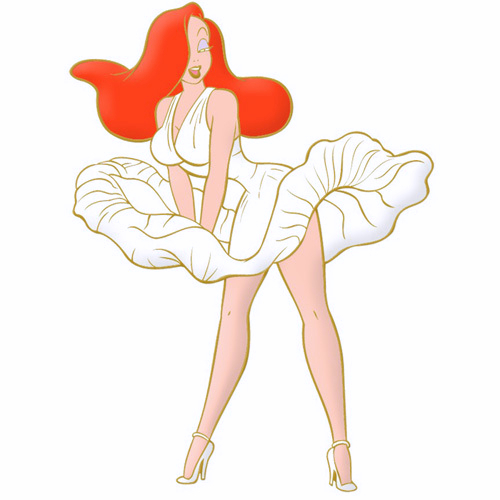 The Jessica Rabbit Movie Star Jumbo gets a 5! 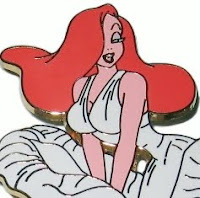 This IS the Holy Grail of Jessica pins and has now rarely ever been seen. It could easily sell for a few hundred dollars today.